Building good track is essential if you don't want to be disappointed and frustrated with your model railroad. The temptation is to rush this step in order to get trains rolling. I'm as guilty as anyone. Here are some track tips. It's now easy to lay down some prefab commercial flextrack. It can also be costly. There are lots of excellent reference books on tracklaying and the railroad magazines often detail the basics. You can also find lots of information on the Internet so I won't dwell on it here. Once the rails are down, many are content to leave things as they are on bare plywood, homasote or foam. Often this is reluctance to mess up the work with ballast or fear of attempting to add some scenery. Remember, track is scenery, too. Take a closer look at track in your area, both the mainline and the seldom-used sidings or branchline. There's lots of little things to notice. Going the extra steps can make a tremendous difference. For an excellent e-book by a veteran modeller to help you build the model railroad of your dreams Click Here! Go to these track links for a few tips from my own experience to help you get started. There are lots of little touches you can add with a few minutes here and there. An oily streak down the center line of the ballast. Extra ties and rail lying alongside the right-of-way for the maintenance crews. Lineside details like electrical boxes, relay sheds and shacks for crews. 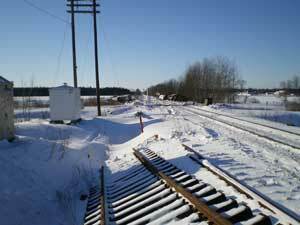 This winter scene photo shows a derailment on the Canadian Pacific line at Utopia outside of Barrie, Ontario. See all the details: broken track, lineside shacks, mileposts, signal boxes, and ruined freight cars in the distance that have been pushed aside after the accident. Maybe a spot for a freight car kit that didn't work out so well or that became damaged! I have a work train that moves around the layout when I am adding details, changing or laying new rails. The work train also adds a wrinkle to operations when a passing siding is out of service due to track maintenance. Make sure your engines and rolling stock are running well both before and after ballasting and painting. Study photos in model and prototype magazines for ideas. Go on some layout tours at regional meets and conventions. It's amazing how adding a detail here and there can make your layout live and breathe. There are many great modeling ideas on layouts in the train photos gallery of my website. Check out ideas from other model railroaders. Go from "track" to track laying and track spikes on real railroads. Return from "track" to my Home Page.